Location: Central Africa. Bordering nations--Angola, Burundi, Central African Republic, Republic of the Congo, Rwanda, South Sudan, Tanzania, Uganda, Zambia. \r\n Area: 2.345 sq. km. (905,063 sq. mi. ; about the size of the U.S. east of the Mississippi). \r\n Cities: Capital--Kinshasa (pop. approx. 9 million). Regional capitals--Bandundu, Bukavu, Goma, Kananga, Kindu, Kisangani, Lubumbashi, Matadi, Mbandaka, Mbuji-Mayi. \r\n Terrain: Varies from tropical rainforests to mountainous terraces, plateaus, savannas, dense grasslands, and mountains. \r\n Climate: Equatorial; ranges from tropical rainforest in the Congo River basin, hot and humid in much of the north and west, cooler and drier in the south central area and the east. \r\n Nationality: Noun and adjective--Congolese. \r\n Population (2011 est. ): 71,712,867. \r\n Annual population growth rate (2008 est. ): 3.24%. \r\n Ethnic groups: Approximately 250 African ethnic groups; the Luba, Kongo, and Anamongo are some of the larger groups. \r\n Religions: Christian 70% (Catholic 50%, Protestant 20%); Kimbanguist 10%; other sects and traditional beliefs 10%; Muslim 10%. \r\n Languages: French, Lingala, Kiswahili, Kikongo, Tshiluba. \r\n Education: Literacy (2008 est.) --French or local language: 55% (women), 76% (men). Enrollment (2010 est.) --primary 91%, secondary 36.5%, higher education 4.6%. \r\n Health (2007 est. ): Infant mortality rate--92/1,000 live births. Life expectancy (2008 est.) --51.3 years. \r\n Type: Republic; highly centralized with executive power vested in the president. \r\n Independence: June 30, 1960 (from Belgium). \r\n Constitution: The D.R.C. has had numerous constitutions, constitutional amendments, and transitional constitutions since independence. The currently operative constitution was approved by 84% of voters in a December 2005 referendum and officially promulgated in February 2006. \r\n Branches: Executive--President (head of state) nominates the Prime Minister (head of government), who, together with his/her cabinet, is approved by parliament. Legislative--Bicameral parliament consisting of a directly elected National Assembly and an indirectly elected Senate. Judicial---Supreme Court of Justice consisting of 26 justices. The nine-member Constitutional Court charged with resolving electoral and constitutional questions has yet to be appointed; the Supreme Court of Justice fulfills this role in the interim. \r\n Administrative subdivisions: The 2006 constitution mandates the reapportionment of the D.R.C.�s current 11 provinces (including the capital city, Kinshasa) into 26 provinces, but implementation of this change has been delayed. \r\n Political parties: 104 parties were elected to the National Assembly in 2011. \r\n Suffrage: 18 years of age and universal. \r\n GDP (2010): $15.3 billion. \r\n Annual GDP growth rate (2011): 6.9%. \r\n Per capita GDP (2011): $210. \r\n Natural resources: Copper, cobalt, diamonds, gold, tantalum, other minerals; petroleum; wood; hydroelectric potential. \r\n Agriculture: Cash crops--coffee, rubber, palm oil, cotton, cocoa, sugar, tea. Food crops--manioc, corn, legumes, plantains, peanuts. Land use--Agriculture 3%; pasture 7%; forest/woodland 77%; other 13%. \r\n Industry: Types--processed and unprocessed minerals; consumer products, including textiles, plastics, footwear, cigarettes, metal products; processed foods and beverages, cement, timber. \r\n Currency: Congolese franc (FC). The U.S. dollar is also used as legal tender. \r\n Trade: Exports (2010 goods)--$8.5 billion. Products--diamonds, gold, cobalt, copper, coffee, petroleum, wood. Main partners--EU, Japan, South Africa, U.S., China. Imports (2010 goods)--$8.0 billion. Products--consumer goods (food, textiles), capital equipment, refined petroleum products. Partners--EU, China, South Africa, U.S.
\r\n Official debt (2010 est. ): $3.9 billion. \r\n The Democratic Republic of the Congo (D.R.C.) includes the greater part of the Congo River basin, which covers an area of almost one million square kilometers (400,000 sq. mi.). The country's only outlet to the Atlantic Ocean is a narrow strip of land on the north bank of the Congo River. \r\n The vast, low-lying central area is a basin-shaped plateau sloping toward the west and covered by tropical rainforest. This area is surrounded by mountainous terraces in the west, plateaus merging into savannas in the south and southwest, and dense grasslands extending beyond the Congo River in the north. High mountains are found in the extreme eastern region. \r\n The D.R.C. lies on the Equator, with one-third of the country to the north and two-thirds to the south. The climate is hot and humid in the river basin and cool and dry in the southern highlands. South of the Equator, the rainy season lasts from October to May and north of the Equator, from April to November. Along the Equator, rainfall is fairly regular throughout the year. During the wet season, thunderstorms often are violent but seldom last more than a few hours. The average annual rainfall for the entire country is about 107 centimeters (42 in.). \r\n The population of the D.R.C. was estimated at 71 million in 2011. As many as 250 Sudanese, Nilotic, and Bantu ethnic groups have been distinguished and named; small groups of aboriginal Pygmies are found throughout the central Congo Basin. Some of the larger groups are the Kongo, Luba, Tetela, and Anamongo. Although some 700 local languages and dialects are spoken, the linguistic variety is bridged both by the use of French and by the national languages of Kikongo, Tshiluba, Kiswahili, and Lingala. \r\n About 70% of the Congolese population is Christian, predominantly Roman Catholic. Most of the non-Christians adhere to either traditional religions or syncretic sects. Traditional religions include concepts such as monotheism, animism, vitalism, spirit and ancestor worship, witchcraft and sorcery, and vary widely among ethnic groups; none is formalized. The syncretic sects often merge Christianity with traditional beliefs and rituals. The most popular of these sects, Kimbanguism, was seen as a threat to the colonial regime and was banned by the Belgians. 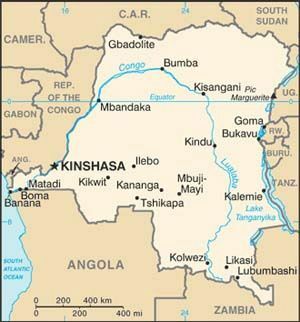 Kimbanguism, officially "the Church of Christ on Earth by the Prophet Simon Kimbangu," now claims about 3 million members, primarily among the Bakongo tribe in the provinces of Bas-Congo and Kinshasa. In 1969, it became the first independent African church admitted to the World Council of Churches. \r\n Before independence in 1960, education was largely in the hands of religious groups. The primary school system was well developed at independence; however, the secondary school system was limited, and higher education was almost nonexistent in most regions of the country. The principal objective of this system was to train low-level administrators and clerks. Since independence, efforts have been made to increase access to education, and secondary and higher education have been made available to many more Congolese. According to 2010 estimates, gross enrollment rates were 90.76% for primary education, 36.5% for secondary education and 4.6% for higher education. At all levels of education, males greatly outnumber females. The largest state-run universities are the University of Kinshasa, the University of Lubumbashi, and the University of Kisangani. The elite continue to send their children abroad to be educated, primarily in Western Europe. \r\n The area known as the Democratic Republic of the Congo was populated as early as 10,000 years ago and settled in the 7th and 8th centuries A.D. by Bantus from present-day Nigeria. Portuguese navigator Diego Cao was the first European known to have visited the area (in 1482), and English journalist Henry Morton Stanley later explored much of the region in the mid to late 19th century. The area was officially colonized in 1885 as a personal possession of Belgian King Leopold II as the Congo Free State. In 1907, administration shifted to the Belgian Government, which renamed the country the Belgian Congo. Following a series of riots and unrest, the Belgian Congo gained its independence on June 30, 1960. Parliamentary elections in 1960 produced Patrice Lumumba as prime minister and Joseph Kasavubu as president of the renamed Democratic Republic of the Congo.